That was mainly for my own benefit, but if any of my faithful readers are in need, I’m happy to oblige. I’m having one of those days, one where “Hot Southern Mess” should be stamped in red across my forehead. I think yesterday morning was the prelude to what Tuesday had waiting for me. You see yesterday I went to my closet to get ready for work and realized my “dressy” jeans were in the dryer… at my parents house… in my Water-Tower-Town, Oklahoma. So instead I was faced with wearing my “work jeans” to work. Not “work” as in jeans for an Editor at an Agriculture newspaper, but “work” as in fit for a ranch hand. They even came complete with bleach stains from my waitressing days and a slash on the inner thigh from climbing over too many barbed wire fences. 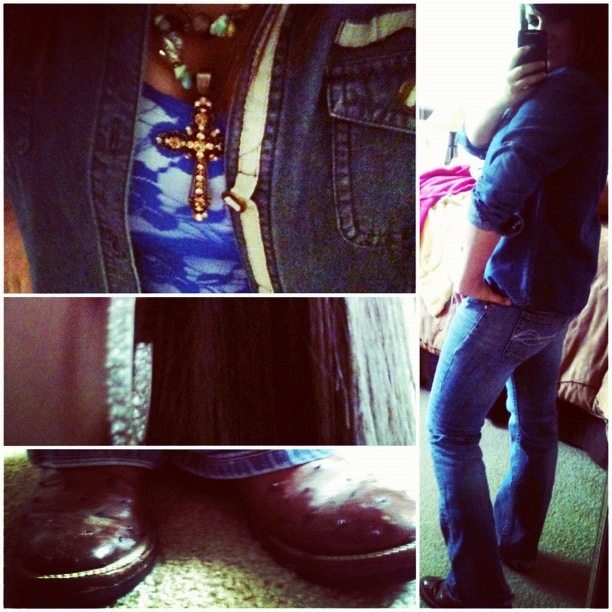 Denim on denim is back! Hello 90’s! While I’m really excited about it, this wasn’t exactly how I planned to rock it. However, my Mother said she thought it was cute. That’s what really counts, right? Well yesterday’s preview went full-blown, when this morning I was awoken by overcast sunlight peeking through the blinds of my Middle-of-Corn, Kansas hacienda. Searching my cozy bed to retrieve my cell phone I stared at the screen in disbelief as I read 8:00 a.m. Wondering why my alarms didn’t go off I saw I had slept through the 5 a.m. workout alarm (I have it in my head to start working out twice a day. I’ve got the evening workouts down, the whole morning thing has yet to happen though.) and then saw my 6:30 alarm had the words p.m. instead of a.m. next to it. I lunged out of bed, text a co-worker to let them know what had happened, hurriedly dressed, Bobbi Pinned my hair, threw on mascara, and jumped in my Pontiac, grapefruit in hand. 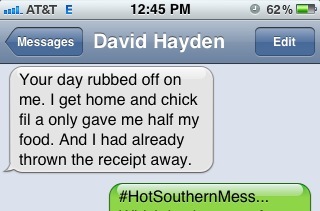 Naturally, Southern Hot Mess mode didn’t stop there. I sloshed grapefruit juice all over my keyboard, dripped coffee on my jeans, lost all my business cards, scheduled a meeting for the wrong day, and cut into my own lunch hour because I forgot part of the steps to updating the website. Very flustered, I was happy to go home for lunch. To which I was welcomed to a sink full of dishes, a burnt out refrigerator light, as well as undergarments and cowboy boots strung down my hallway from my tornado version of getting ready for work. Oh and to top it off, I forgot to take the trash to the road this morning, which I have forgotten every Tuesday for the past month and a half. It’s officially past needing to be done. Looks like someone else has “First World Problems” now… said with an Okie twang. Okay, so maybe I’m contagious. 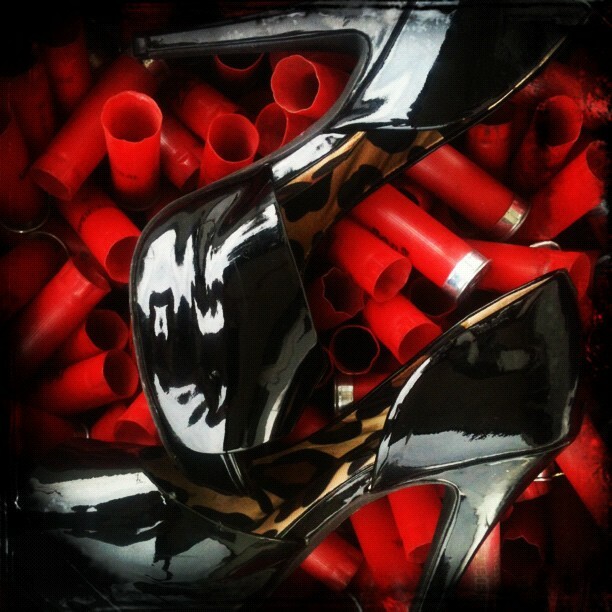 Jessica Simpson heels and a 5 gallon bucket of shotgun shells on a front porch in Kansas… It makes this Backwoods Barbie’s heart smile. This post just made my day, and you must have done something right because it just started raining in Stillwater! Thank you! #NormaJean Thanks you too I’m sure! I’m SO glad I’m not the only one who has forgotten to take the trash to the curb for the last month! Next Thursday, trash man, next Thursday.